Tag Archives for " Trolley "
Salons are busy places. There are customers going in and out all day and every customer has unique requirements. In this rush of daily business, it is important for the staff to stay organized and disciplined. Hunting for supplies and carrying them to each client's chair can be a big hassle. That's why a trolley can be really useful in salons. 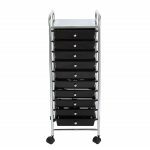 By using a salon trolley, staff members like hairdressers, barbers, and beauticians can have easy access to their tools and also manage their workstations in a better way. It helps in better organization and maintenance of the salon and also leads to increase in productivity of the staff as they know where everything is.